Is your holiday rental actually rented out? Australia has a lot of popular holiday destinations and the ATO is reminding taxpayers that it has its eyes on rental properties once again. The ATO claims some people are claiming deductions for holiday homes even where the property is not actually being rented out, or not “genuinely available” for rent. Last year, they identified a large number of mistakes with deductions for rental properties, particularly with regards to holiday homes. 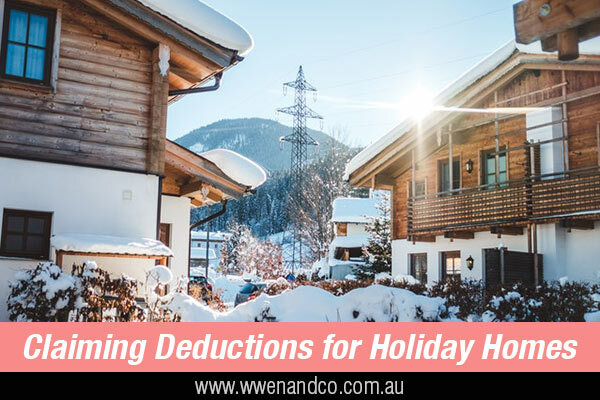 The ATO points out there is no problem with using your rental property for a holiday rental, but as a rental property owner, you need to remember that you can only claim tax deductions for expenses made during a period when the home is rented out or genuinely available for rent. If your holiday rental property rent is at a discount or “mates rates” you can only claim deductions equal to the amount of rent charged. The ATO cites one case where the taxpayer had to pay back more than $45,000 in tax from deduction claims made for a holiday home they were renting out to friends and family below the market rate. Property owners should be aware that technology enhancements and the ATO’s extensive use of data is allowing it to identify claims that can be deemed suspect, or in need of checking, now more than in past income tax years. There is, of course, nothing untoward with rental property owners claiming a deduction on expenses for an investment property when it is rented out — this is a stalwart of the tax regime concerning investment property. But even if it isn’t rented out, it is still possible to claim a deduction if the property is “genuinely available” for rent. Four things you need to ensure regarding holiday rental properties so you are less likely to question by ATO. Advertise your rental property properly – Owners need to advertise in a way that maximises exposure to potential tenants, such as an online site. Advertising in ways that limits exposure to potential tenants, such as by word of mouth, can mean that the ATO has more reason to think the property may not be “genuinely available” for rent. Location and condition of your rental property – It is important that the rental property is in a location, and maintained in a condition, that tenants will want. If the property is poorly cared for, or in a remote and uninviting area, it is unlikely to be tenanted, and may not pass an ATO assessment as being genuinely available. Reasonable conditions for your rental property such as the rent charge – If an owner places unreasonable conditions that reduce the likelihood of the property being rented out, such as setting the rent above the market rate, the property may not be considered genuinely available for rent.Likewise, if you, your family or your friends stay for free, your property will not meet the criteria during that time period. If the property is being tenanted at a discounted rate (“mates rates”), the allowable deductions are limited to the amount of rent charged, not market rates. Rental property availability – If an owner refuses to rent out the property to interested potential tenants without a good reason, this indicates that they may not have a genuine intention to make income from the property and could be reserving it for private use. In this case, the property will probably not meet the ATO’s criteria for being genuinely available for rent.